A Belgian hiker died while trekking "The Wave," a popular rock formation in Arizona. 49-year-old Christophe Pochic died from apparent heat-related causes Monday night. Only 20 people are allowed to visit The Wave each day. While hiking the popular rock formation known as "The Wave" near the border between Utah and Arizona, a Belgian tourist died of apparent heat-related causes. 49-year-old Christophe Pochic was found dead Monday night after his 16-year-old son called his mom at a hotel for help after his dad became disoriented, said Kane County Sheriff’s Sgt. Alan Alldredge. 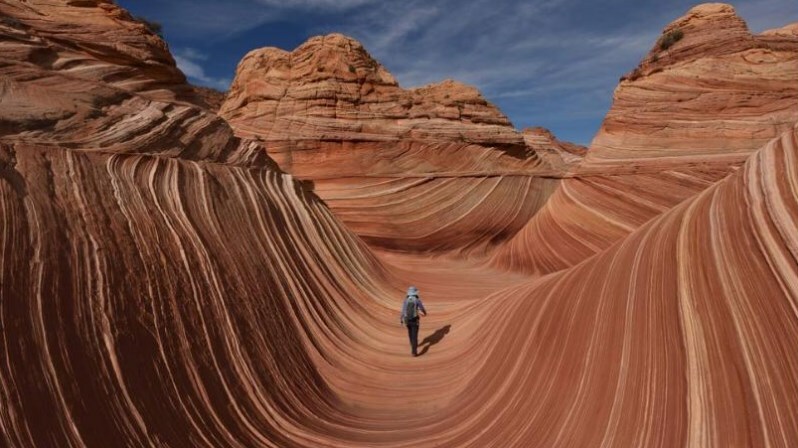 Alldredge says it’s the first death at The Wave in the Vermilion Cliffs National Monument since a trio of deaths in 2013. The geological gem attracts worldwide visitors with its swirls of searing red, orange and yellow that fold into a bowl. The 6-mile, roundtrip hike is unmarked and cellphone reception is spotty at best. Only 20 people are allowed to visit each day, chosen in a lottery system. 0 Response to "Belgian Tourist Dies of Heat-Related Causes While Hiking Famous U.S. Landmark"